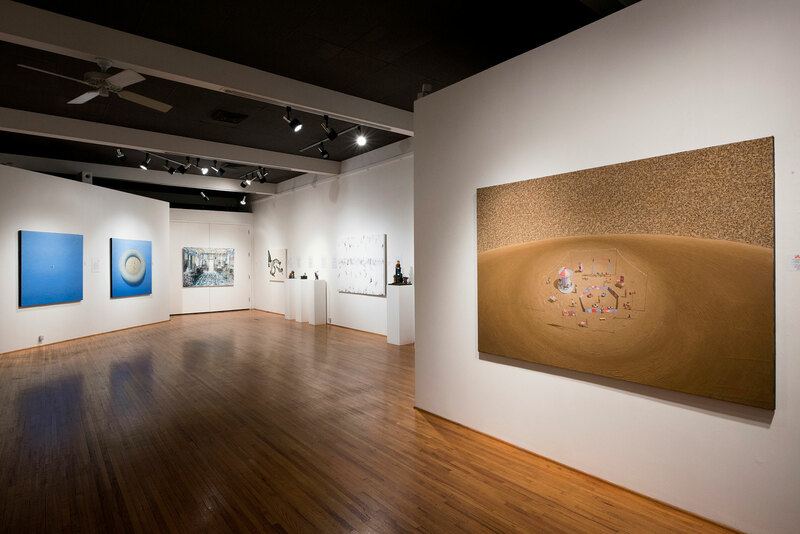 Along with a wall of new conceptual works by Kyle and a spectacular 12-foot panoramic photograph of mid-Manhattan and lower Central Park by Robert Catasus, “Eccentric Visions Part II,” the ongoing exhibition at ArtSpace/Virginia Miller Galleries in downtown Coral Gables, now includes new magic realism paintings by Mario Segundo Pérez. Kyle, a native Floridian, depicts such “psychological collisions” as the juxtaposition of an astronaut and a young woman in a summer dress—the classic conflict between the male self-image and that of a female, a timeless classic love story. 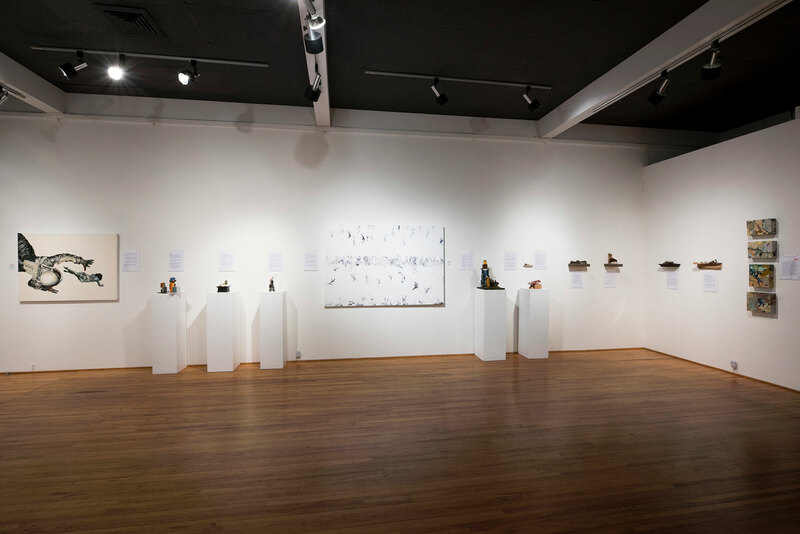 Along with seven canvases, Kyle is exhibiting several sculptures and wall-mounted constructions, often with pointed visual messages, such as “Baggage,” with diminutive male and female figures, each dwarfed by its towering obelisk of a motley assortment of luggage. 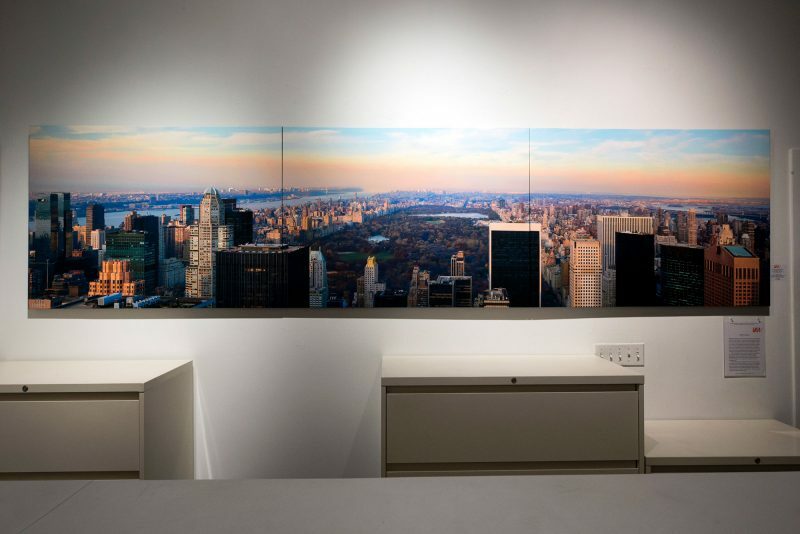 Taken late in the afternoon, Catasus’ astonishing photograph—actually, seventeen shots stitched together—taken from Rockefeller Center is so sharp that cars can be seen crossing the George Washington Bridge, nine miles uptown. Catasus also is represented by a four-foot print of the space frame supporting beams of the East Wing of the National Gallery of Art in Washington, D.C., which can be visually “read” as a geometric abstraction. 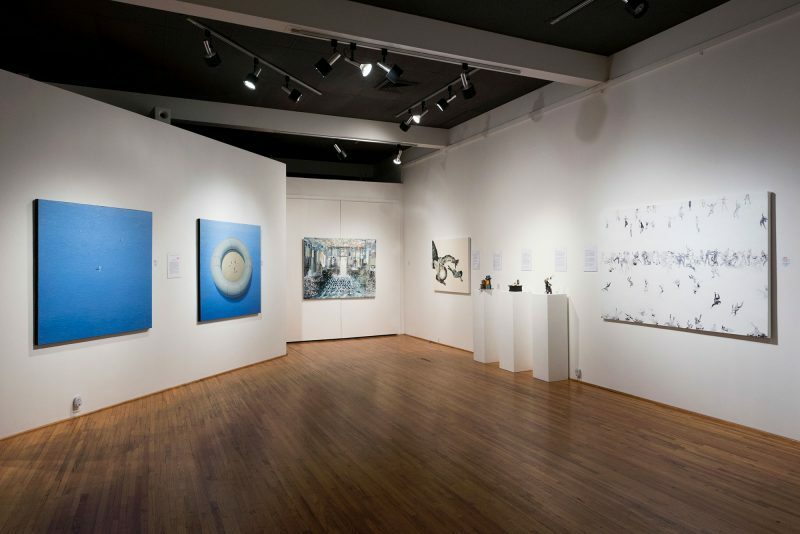 Altogether, the works of six artists can be sampled in “Eccentric Visions Part II,” according to gallery owner and director Virginia Miller, who notes that “Because each has a unique style and subject matter, they appear unrelated at first glance, but their common thread is that each of these artists takes reality and stretches it into another dimension that reflects their particular visions. Day, who was born in Baton Rouge, Louisiana in 1951, has exhibited since 1981 in leading museums and galleries in every corner of the U.S. as well as England, New Zealand and Zimbabwe, and is included in more than two dozen prestigious museum and corporate collections. Unlike Day, whose mosaic-like collages create an overall impression, Renato Meziat, a Brazilian autodidact, paints still lifes and figurative canvases so realistic one can almost reach out and touch their flowers, glassware and other subjects. Inspired by such leading Latin American realists as Claudio Bravo of Chile and Julio Larraz of Cuba, Meziat has participated in exhibitions since 1979 in such leading venues in Brazil and the United States as Hammer Galleries in New York City and Galeria Ipanema in Rio de Janeiro. His first solo exhibition at ArtSpace/ Virginia Miller Galleries opens on November 2nd. City-scapes and interiors by Anders Moseholm, a Danish artist being shown in the gallery for the first time, “create a mood–a sense of motion, an authentic emotional scene,” according to the artist. Moseholm has exhibited internationally since 1997, including solo and group exhibitions in China, Denmark, Estonia, France, Germany, Spain, Sweden, and the United States. His work is included the such important Danish collections as the Vejle Kunstmuseum, the Skive Kunstmuseum, the Carlsberg Foundation and the Danish Arts Foundation, as well as private and corporate collections in China, Europe and the United States. The magic realism of Mario Segundo Pérez of Argentina is characteristic of a chiefly Latin-American concept in painting, literature and film. Many of his paintings are based on the games, parties and bonfires of his childhood in the arid, desert-like area of western Argentina. Recipient of a Pollock-Krasner Foundation Grant, among other awards and honors, the 58-year-old artist has had solo exhibitions in South America, the United States and Spain along with Berlin and New York. “Eccentric Visions” will be exhibited at ArtSpace/Virginia Miller Galleries, in the heart of the Coral Gables business and restaurant district at 169 Madeira Avenue, through October 24, 2018. For gallery hours and other information, call 305-444-4493.